Paneer Butter Masala is one dish that I and my brother have obsessed over all our childhoods. Every-time we stepped out for dinner, lunch or even breakfast at times, this is what we ordered along with a standard side of Naans. I can safely say that this is THE dish which is enjoyed along all ages, heck my son of 1.5 years loves it too! The rich,buttery, delicately balanced tomato gravy- with just the right amount of sugar and sour – Sigh! The butter Masala Gravy also known as the Makhani Gravy , at it’s best,should be a medium spicy, slightly sweet,smooth gravy which can go with anything from Peas to Tandoori Chicken to Eggs.It’s worthwhile just to have this one gravy on your repertoire mastered because of the sheer number of possibilities it holds. Paneer Cubes smothered in rich orange gravy made with Onions,tomato and Cashews. This recipe is adapted from myfoodstory. When I first read the recipe of Panner Butter Masala, I was flabbergasted.The name “Butter Masala” suggests a certain decadent quality to it-I though there ought to be a lot of deep frying and at least an hour at the stove.In my mind, it’s only fair that something so yummy should take more time and effort but I was wrong in that assumption. In fact it’s a pressure cooker recipe-with barely any sautéing, let alone frying.The beautiful orange hue comes from a copious use of tomatoes and off course the Kashmiri chillies. The secret, to the best Restaurant Style Paneer Butter Masala ,is the almost blasphemous ingredient – ketchup- which rounds off the dish so beautifully that you might be in a danger of using it in all your tomato based curries! Now just because its named Makhani/butter Masala doesn’t mean it cannot be made vegan or even Paleo.The soul of the gravy is still tomatoes,spicies and cashews.Therefore, to make a healthy version of this, simply swap butter with quarter the quantity of the oil.Also you get about 3-4 cups of sauce with this recipe and in the grand scheme to things the butter really gets well divided.You can omit or swap cream with coconut cream. Paneer can easily be swapped with chicken or fish or tofu. The Makhani Sauce is so versatile that you could drizzle it over a well done piece of chicken breast or on top of fried or grilled fish. Also, make an instant Egg curry with this sauce by just adding boiled eggs to it, which incidentally is the dinner tonight! Although the best use of it by far would be to add some left over tandoori chicken to this and voila you have your Chicken tikka Masala! I never thought I could make THE PANEER BUTTER MASALA in my kitchen , let alone resturant quality ,but here we are! My reasons for stepping out of the house are really dwindling.This has become a weekly affair! 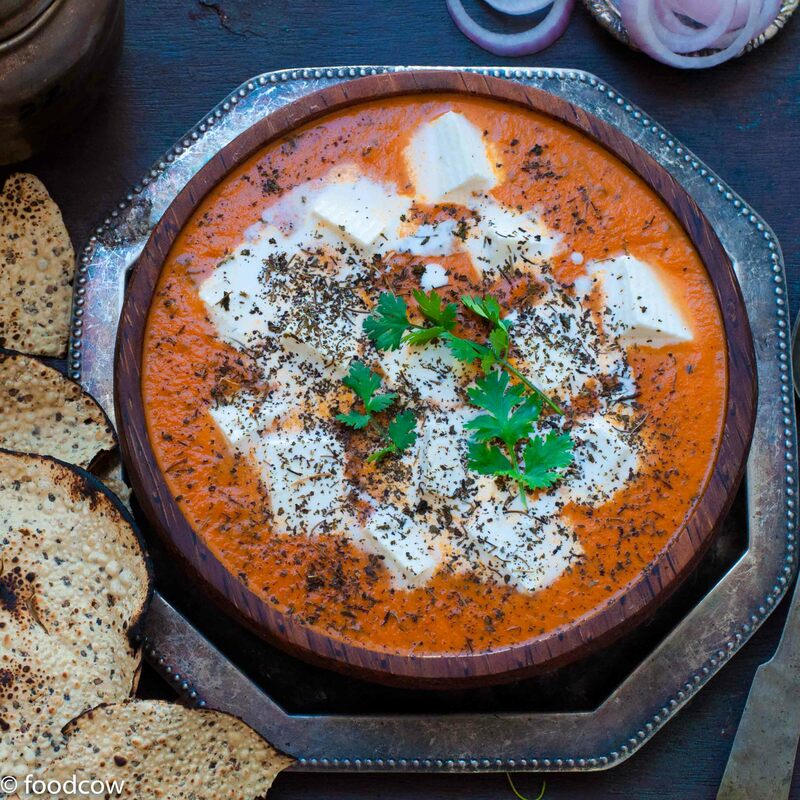 Easy Resturant style Paneer Butter Masala or Paneer Makhani- A Versatile Rich Indian Curry -with Vegan and Paleo options inside the post. In a pressure cooker, add the tomatoes, onion,poppy seeds,cashews, peppercorns,cardamomns, cloves,ginger,Kashmiri and Green chillies along with 1 cup of water.Mix it up. Pressure cook for 2 whistles.Let it cool down. Puree this mixture into a smooth gravy. Heat the butter in a pan.Once it starts to melt, Add the pureed gravy. Sprinkle the garam masala, chilli powder,Sugar,turmeric and the ketchup.Add the Salt and check the taste. In another pan, roast some Kasoori Methi(dried Fenugreek leaves).Crush between your palms and sprinkle on the gravy. Let the gravy boil- once you see bubbles on the surface and the oil separating-your gravy is ready. Add in the Panner cubes and serve. In the inner pot , add the tomatoes, onion,poppy seeds,cashews, peppercorns,cardamomns, cloves,ginger,Kashmiri and Green chillies along with 1 cup of water.Mix it up. Choose the "PRESSURE COOK" setting and pressure cook in "SEALING" position for 8 minutes.Let the steam escape naturally. Once it cools, take out the Bayleaf,Cinnmon Stick,Cardamoms and the Cloves. (as best as you can)Puree this mixture into a smooth gravy. Cancel the "Pressure Cook" setting.Select the "SAUTE" setting.Heat the butter in a pan.Once it starts to melt, Add the pureed gravy. This gravy freezes very well. At times the kasoori methi has dirt and mud in it.I usually wash and roast it but if you have homemade clean kasoori methi, you do not need to roast it. A special thank you guys for the immense love you have been showing on my new recipes.I cant say this enough but I do so love it when you write to me and share your pictures with me. Some other amazing Indian recipes for you guys! One of the best paneer buttermasala recipe I have come across. Lip smacking and has that restaurant like taste! The best part is it is so very easy to make!! !5 stars for the recipe Chhavi!! !tFor some reason I am not able to click on the 5 star option and therefore have submitted 4 stars!!! Aww Ashwini! You have made my day by saying it here! Thankyou for the vote..
Thankyou so much Swati! This is my absolute favourite vegetarian recipe too! Thank you so much Ankita…😊😊 Makes my day to read comments like these!